To clarify the role of concomitant carpal lesions in dislocated distal radius fractures (DRF), 104 consecutive patients with DRF underwent a preoperative morphological examination using CT and MRI. 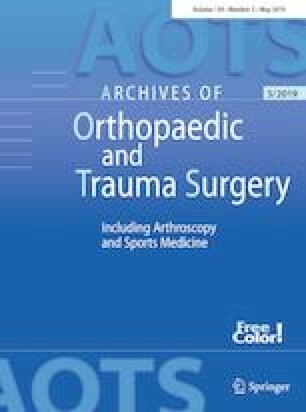 The study was performed between 2004 and 2006 with the aim of recording all types of concomitant carpal lesions as well as their consequences after 1 year. Carpal lesions of different types were found in all treated cases of dislocated DRF. A clinical follow-up 1 year (13.9 ± 6.5 months) after surgical treatment showed no correlation between the carpal lesions and the treatment outcome (previously described by Gologan et al. 2011). A second follow-up study ( > 10 years postoperative, range 11.2 ± 0.9 years) was initiated to find suspected later decompensations of the concomitant carpal lesions. A total of 37 of the original 104 patients could potentially be followed up: 22 patients had passed through both follow-ups and 15 could only be contacted with restrictions. 27 patients had died, 24 patients were excluded due to the presence of dementia or explicit rejection, and 16 patients could no longer be found. Using the Castaing score, the first follow-up after 1 year resulted in an average of 4.95 ± 3.1 points (range 0–12; “good result”) and the second follow-up after 10 years in an average of 5.91 ± 2.9 points (range 2–14; “good result”). Again, there were no correlations with the primarily recognized carpal lesions [comparable groups 22 vs 22 (identical patients in both follow-ups); lost to follow-up rate 15.4%]. These results suggest that concomitant carpal lesions are primarily prevalent and detectable in (nearly) all dislocated DRF cases. However, with the usual protection of the wrist and the carpus after surgical treatment of DRF, these lesions often do not decompensate or require treatment, even after 10 years. All the authors have made substantial contributions to all of the following: (1) the conception and design of the study, or acquisition of data, or analysis and interpretation of data; (2) drafting the article or revising it critically for important intellectual content; (3) final approval of the version to be submitted. All the authors disclose any financial and personal relationships with other people or organizations that could inappropriately influence (bias) our work.